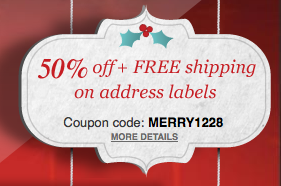 Snapfish is offering 50% off all their address labels and they ship for FREE too! Use code MERRY1228 to get in on the savings. Be sure to shop through Ebates and get 10% cash back! Log in/Join HERE and do a search for Snapfish, click on the link and then the Shop Now banner. Be sure to only shop in that window. Thanks, Southern Savers.